Hey everyone! I thought it might be fun since it is a new year to talk about what everyone's projects or goals are for 2019?! A lot of my year will be dedicated to embroidering my Cloud City Leia Cloak but when I need to take a break I plan on making Leia's senatorial gown and fixing/improving upon aspects of my Rey costumes. My current project and goal, is to have my first cosplay approved so I can join the Legion but will have the cosplay ready for FanExpo at the least. after that, I have not decided what the next project will be. Awesome! What character are you working on?? Is it Barriss Offee like your username? Oh nice, I have a rebels Ahsoka planned at some point so having a Bariss would be cool. I (finally after um 3.5 years) submitted my Twi'lek Jedi last week Once that's approved I think I will also see if I need it separately approved without the headpiece because I can only wear that for an hour or so before the headache gets to me. I don't have any more costumes on the horizon for myself but I'm still trying to get all the pieces for my dad's Han costume. I had the pants and shirt custom made as well as the holster. We've been waiting nearly 2 years for the jacket from Anovos (ya I know...Anovos, but it was only $350 compared to the $750 from other decent makers). I've been sent two pair of boots from the maker and he made them too small the first time, and gigantic (we're talking 3-4 full sizes too big) the second time. It's now been well over a year since the first pair was finished so I'm starting to get pretty discouraged. I'm also trying to get my mom to decide which Leia she wants to build. She's picky about colours and hates the olive green/grey of the jumpsuit which would be the easiest one and most comfy. We may end up with the blue dress unless there are some new outfits in the upcoming episode (I think they said they may use some deleted scenes of her in the new one?). Congrats on the submit Tammy!! Oh wow, I honestly thought they were the same outfit LOL. Same jacket? They are beautiful but I'm not sure where to find someone who could make them. Any ideas? 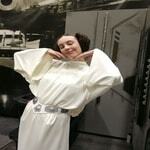 I would recommend checking out the Leia Cosplay FB group! There are lots of Leia costumers there that do commissions. Unfortunately this will be the first Fan Expo I've had to miss Hubby gets home from sailing the Friday it starts and I can't turn around and say "bye"...well I could, but he would be very sad. Will you be coming to Victoria for Capital City Comic Con?